An entire industry of academic research and practitioner conferences has arisen around sports analytics. However, practitioner-oriented research on how teams in all sports can be successful in applying analytics is sparse. 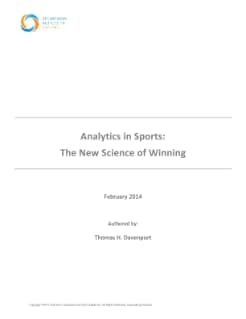 Analytics thought leader Thomas H. Davenport sought to fill in the gaps with a five-month independent research study that included interviews with more than 30 leading sports organizations and several leading vendor organizations in the sports industry, such as companies that do video analysis and companies that monitor athletes with biometric devices. SAS UK is the Official Analytics Partner of British Rowing and its high performance arm - the GB Rowing Team. We also help 75,000 organisations around the world take their data… And do amazing things… We help organisations turn large amounts of data into knowledge they can use, and we do it better than anyone. It’s no wonder an overwhelming majority of customers continue to use SAS year after year. Find out more, Why SAS?